Hi Sandra, tell us something about you by way of introduction. What’s your name? How long have you worked for yourself? And perhaps something surprising readers may not know about you. 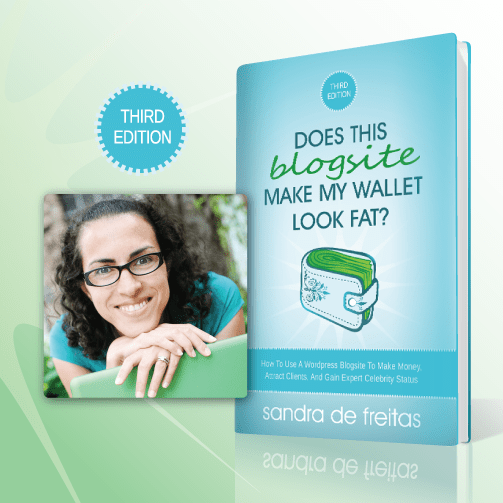 My name is Sandra De Freitas and I am the CEO of WPBlogsites.com. I have worked for myself for 9 years now and I’m highly unemployable. Its funny people think that because I have a degree in Computer Science that I must have zero personality. The opposite is true. I have loads of personality and I love to make people laugh. I have emceed three live events in the last year and believe me you cannot be asked to emcee an event if you have zero personality. Now tell us about your business. What’s it all about, how do you think and feel about it now, do you have staff and premises or work mainly alone at home? What aims and ambitions do you still have for your business? My business is centered around taking technical and marketing tasks off the hands entrepreneurs, so they can focus on the things they do best and so they can have some leisure time. The projects we work on are typically WordPress blogsites, membership sites, online training programs, managing and supporting virtual events, product creation, copywriting, graphics, video editing, ebook creation, SEO and more. When I started this business back in 2005, my goal was to make enough money to quit my corporate job. I did so within 11 months. Had you told me back then that I would have a team of 25 contractors working with me, I would have thought you had gone mad. I love my team and thanks to them we can take on more clients. Each team member works from their own homes across Canada, the USA and the UK. This series of interviews is designed to inspire others, mainly women, on the same path. What tips would you share with them which would short-cut their journey to happiness being their own boss? Hire a coach who has accomplished what you want to accomplish and make sure their values are in alignment with yours. Learn from their mistakes. If you work from home put in boundaries and keep them. If you let your children play in your office, they will be accustomed to walking in at any time and thus disrupting you. Workout a system to communicate with your spouse instead of allowing them to enter your office when they feel like it. You want to minimize your disruptions so you can focus and of course you don’t want a family member interrupting your business calls. There will be days when you feel like it’s too hard to be your own boss. We have all had them, it’s natural. Evaluate the situation. Is it too hard temporarily or is the situation more permanent? What did you struggle with most in your start-up phase, and how did you crack that? Setting boundaries and building credibility. I found the first 2 years to be hard as I was just getting known in the industry (coaches were my niche then) and I didn’t have a lot of experience in the online marketing world. I just kept pushing and educating myself on online marketing as well as getting my hands into all the technology. I was a trained coach so a lot of the coaches liked that I “got” them. As for boundaries this had all to do with my family and friends. I would get social calls in the middle of the day as they thought since I didn’t have a boss it would be ok. I also had friends and acquaintances that thought that because I was an “entrepreneur” that I was automatically wealthy. Oh and I had requests to pick up people from the airport and babysit their kids since I worked from home. What have you learned about yourself while working solo? Coffee is my best friend! Besides that, I found that I work much harder and smarter now that I work for myself. When I worked for others I wouldn’t work so hard on Fridays as no one else did either. Now I work Fridays and when I travel for work or am otherwise catching up, I catch myself working Friday nights. Did you choose self-employment or did it choose you? A bit of both. I always wanted to be self-employed I just didn’t know what I wanted to do, sell or offer. I thought I wanted to be a Life Coach but at a business building workshop for Coaches, I realized that I could use my technology background and personality to support Coaches. I did hate my job, my boss and the directors in my last job. Their values were just not in alignment with mine. I struggled. What one encouraging thought sums it all up? I used to work crazy hours (10am-1am), now with my team I work from 11am-4pm each day. I take long weekends off and at least 3 weeks off a year and I don’t have to get my vacation time approved by anyone. Where can readers find out more about you and become your fans and followers? My website is WPBlogsites.com and I’m on Twitter @TechCoach and on Facebook at WordPressBlogsites. What exciting projects do you have coming up you would like my readers to know about, Sandra? I just launched the 3rd edition of my book “Does This Blogsite Make My Wallet Look Fat?” It’s a great book for those getting started with WordPress or anyone who wants to make their WordPress blogsite even better. Do enter the competition (below) to win a free copy of my book. Do you ever feel lonely and isolated when working for yourself? Are you an introvert or an extrovert? How do you get your social needs met? What do you recommend to others in this regard? I am 100% extrovert. I don’t feel isolated. I have team members that I chat with on Skype daily. I have a huge family that I see on the weekends. I am a volunteer dog walker at the local shelter. I am also a member of a few masterminds and I have the privilege of seeing them in person at workshops throughout the year. I recommend that you do network with people in your target market but that you also do something completely unrelated to your work that is fun. I never thought I would enjoy volunteering but volunteering at the shelter is the highlight of my week. I get great joy out of seeing the dogs, getting snuggles from them and playing with them. I also socialize with the other volunteers. We tell stories, jokes and one man always shows me pictures of his fishing trips! It’s awesome. I did feel very unsocial when I started working from home so I signed up for belly dancing classes, cooking classes and more. It was fun and so very opposite from my work. We need that time away from work to clear our heads.